Have you got what it takes to make it through the maze? Many enter the maze. Not all of them make it out… It takes the focus of a secret agent. The intellect of a rocket scientist. The intuition of a wizard. The luck of the Irish. This is a real world choose your own adventure. One wrong turn could have you lost in the maze, perhaps forever. You will need to work as a team and use your wits to find your way to its centre and then back out. Our largest maze is over 2 meters tall. It is a great challenge and its geometric shape is a delight for photographers. Once you reach the centre of the maze you have great views from the viewing platform. Our smaller mazes were designed especially for young children, allowing them to wonder through the mazes at their own pace. Parents are able to watch them from the side lines and see the delight on their faces that they completed the maze on their own. Boneo Maze is not just a destination, it is an experience like no other. Surrounded by 27 acres of Native flora and fauna you start to feel the effect of this natural environment immediately. A calming, welcoming space that engages you and reminds you to enjoy the moment you are in right now. The ample car park gives you a sneak peek at our Pro designed 18 hole Mini Golf Course, a favourite amongst many visitors here at Boneo Maze. As you walk through our entrance you are met with a friendly smile and our brilliant lakeside café. As you check in, the smell of Barista made coffee stimulates the senses of what is to come. Exiting the building you are met with a choice; left to the Mini Golf or right to our Hedge Maze. The path leading down to the maze entrance gives a spectacular view over the waterways. Meandering past the maze entrance, you begin your stroll along the 1.5km boardwalk. Winding through the native tea-trees and wetlands you are lead through an enchanting environment where birds nest, frogs croak and Water Hens paddle on the waterways. At the end of the boardwalk the gardens open up and you find yourself in our Giant Games Garden. Childlike excitement rises in you as you see Giant Chess, Checkers, Hookey and Connect Four greeting you like an old friend. Discover the magic of our fully operational vintage carousel (circa 1864). Large, shady trees provide the perfect space for a picnic while you lay back enjoy the sounds of nature. A new development for the park, 2015 saw the first expression of LANTASIA – a light sculpture event in the night garden. Running every night during January, the 2015 LANTASIA event included twilight mini golf, children’s lantern craft, dining from the lakeside cafe and the mesmerising sculptural lantern display. 2016 saw the launch of our second event Lantasia – Dreaming. The lanterns whispered the story of Indigenous Australian animals and plants and explored ideas underpinning Aboriginal Dreamtime stories. Dreamtime characters shimmered on the landscape as visitors encountered the Elder wombat, the heroic eagle Bunjil, the thirsty frog Tiddalik and their friends. These specially designed new sculptures captivated visitors for over 5 months as they transformed bush land and peaceful gardens into a dream like walk-through journey. We are currently designing Lantasia 2017, with our grand opening launching this year on Boxing Day. Exiting the building you are met with a choice. Left to the Mini Golf or right to our Hedge Maze. The path leading down to the maze entrance gives a spectacular view over the waterways. What could be better than to play your favourite family board games? Playing them super-sized that’s what! Our giant games are a great way to re-connect and include chess, draughts (checkers), snakes & ladders, hookey, connect four, noughts and crosses and other mind-bending puzzles. The games are old favourites with a modern twist, enabling everyone in the family to play. 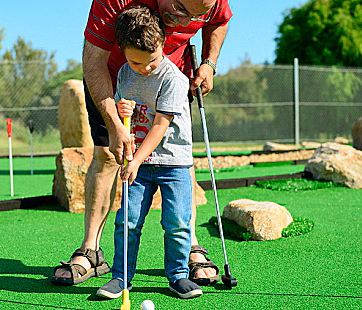 Our professionally designed 18 Hole Mini Golf Course welcomes all ages and abilities. Designed to challenge even the highest standard of golfer our 18 holes will have you chasing that ever-elusive hole in one! With children teeing off on the red markers and adults playing off the blue the scene is set for an epic battle. If you fancy yourself as quite the professional the black markers will be your starting point. Unlimited rounds of Mini Golf are included in your entry price so a rematch to settle the score is no problem. The boardwalk winds through tall native tea-tree to our bird hide and borders the waters edge throughout the gardens. 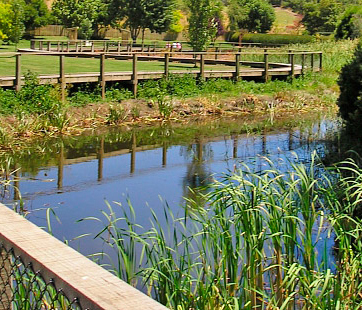 Our wetlands cover over 15 acres of waterways and lakes. 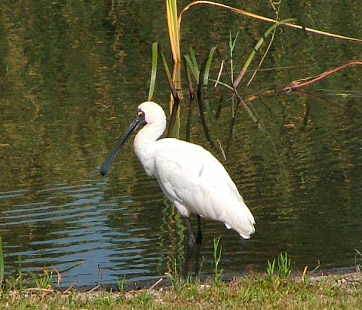 The wetlands are home to many species of birds, some on the endangered list, including black ducks, wood ducks, water hens, pelicans, swans, cormorants, herons, egrets, spoon bills, cranes, plovers, and small bird species including finches and willy-wag tails. 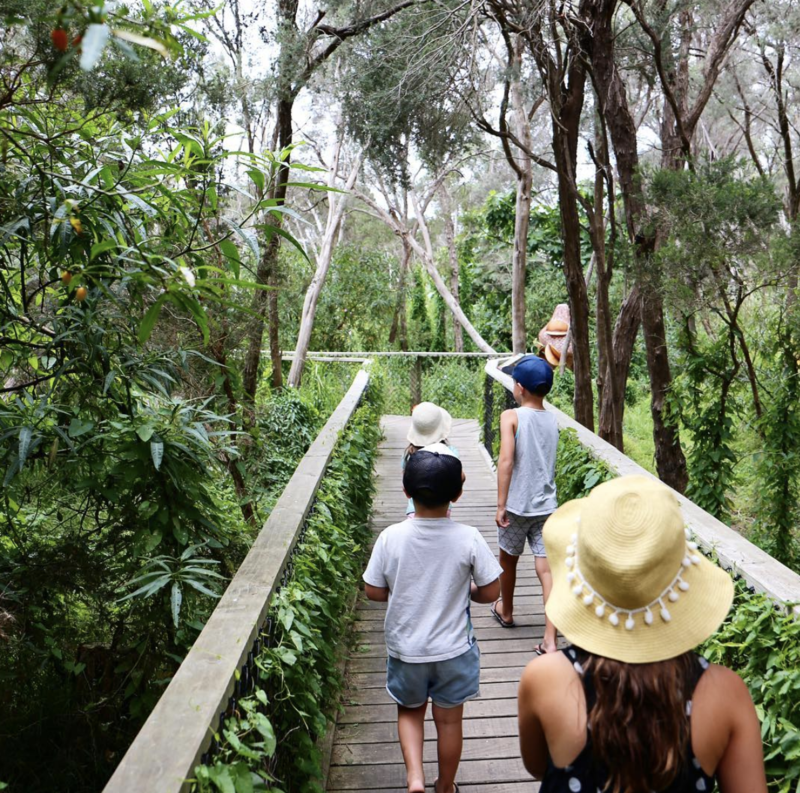 Long tailed skinks, echidnas and bush wallabies can been seen if you walk quietly along the boardwalk in one of the largest stands of swamp tea-tree left on the peninsula. Long tailed skinks, echidna’s and bush wallaby’s can been seen if you walk quietly along the boardwalk in one of the largest stands of swamp tea-tree left on the peninsula. Our newly licensed Lakeside Kiosk offers service with a smile with delicious food in a family friendly atmosphere. We have a collection of delicious pies and sausage rolls, sandwiches, salads and cakes*. 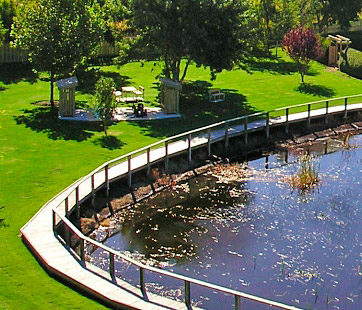 You can enjoy a glass of wine on our lakeside deck or grab an ice-cream and take a walk along our wetlands boardwalk. Our jumping castle is located right next to the kiosk so you can enjoy a coffee while the kids burn off some energy. 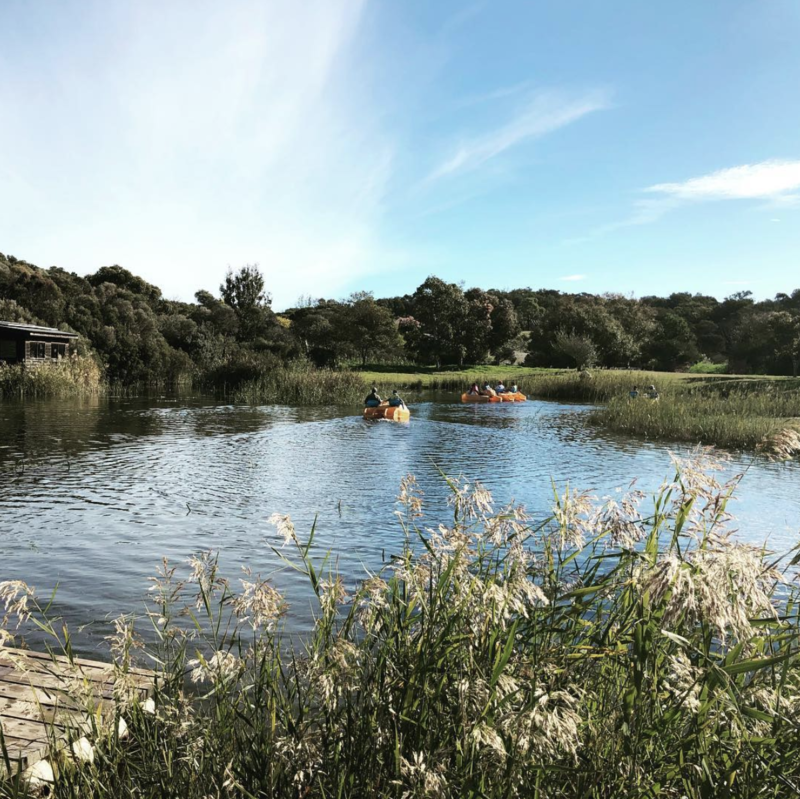 A great way to finish off a round of mini golf or a maze adventure is to indulge in a perfectly crafted barista made coffee, a glass of wine or a craft beer from one of the prized breweries and wineries of the Mornington Peninsula. Relax and enjoy the view from the deck overlooking the wetlands or keep toastie-warm by the fire during the cooler months. *Please note we only have tea, coffee, cold drinks, snacks and cakes on school term weekdays. On weekends, school holidays and public holidays our kiosk is fully operational. The kiosk area is available for group events, functions & get-togethers. For more information please call us on (03) 5988 6385. Our newly licensed “Lakeside Café” offers service with a smile and great home-style cooking in a family friendly atmosphere. Our seasonal adult and kids menus are all about providing delicious heart-warming meals and snacks that will fuel your mind, body and soul. 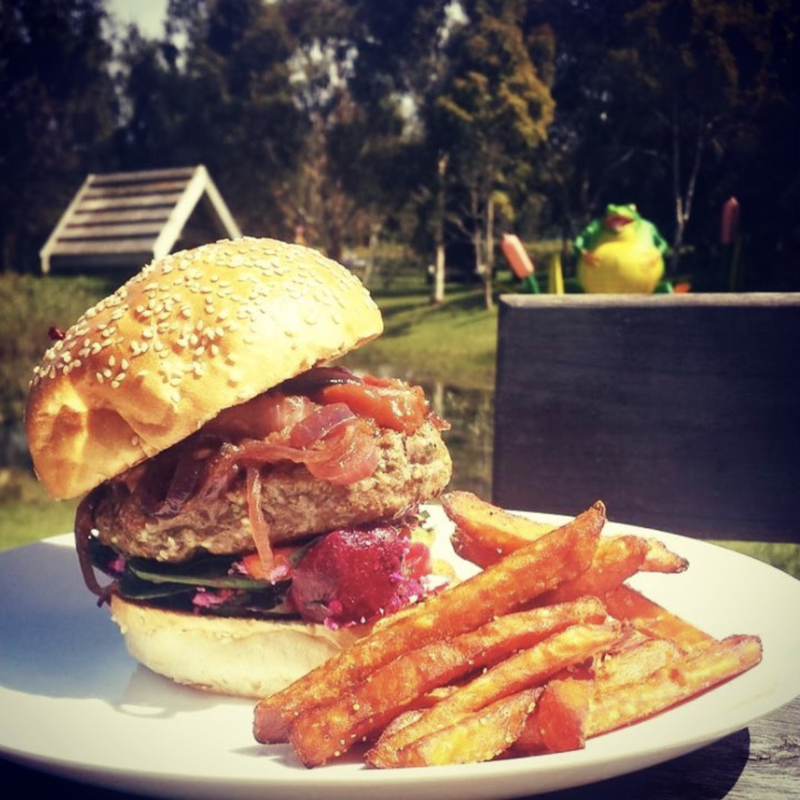 Featuring fresh, locally sourced ingredients we represent the flavours of the Mornington Peninsula. The cafe is available for group events, functions & get-togethers. For more information please call us on (03) 5988 6385. Adventure zone is now open! Everyday on the (vic) school holidays and weekend 11am-3pm except winter school holidays and in extreme weather. Please note our pedal boats are no longer part of adventure zone as they are located in our Sand Sculpting exhibition area. 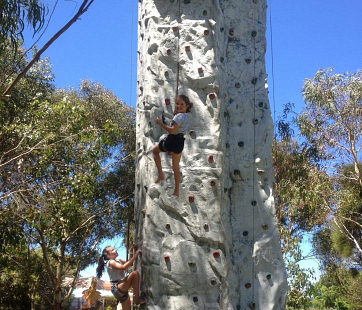 Test your skills on the climbing wall or bungee trampolines *Please note our pedal boats are no longer included in our Adventure Zone as it is now located in our new Sand Sculpting exhibition. Boneo Maze warmly welcomes guests of all ages and abilities. We offer 2 disabled parking spots at our front entrance and an ambulant toilet in our main building. 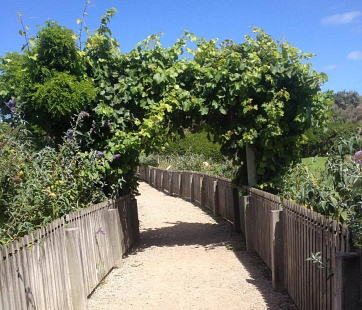 Our boardwalks and pathways are a minimum 120mm wide to fit a wheelchair, mobility walker or pram there are no steps on the property restricting access. We have a variant of ground surfaces including gravel, grass, timber decking and concrete. We offer lots of quiet spaces to retreat for those with sensory sensitivities. A downloadable sensory kit is available upon request. We accept companion cards and companions are offered complimentary entry with their child or pension card holder. Unfortunately, due to our sensitive environment dogs are prohibited from the park, including guide, hearing and assistance dogs. The end of summer brings with it the adolescent wildlife from spring, mesmerising sunsets and the perfect weather to enjoy it all in. 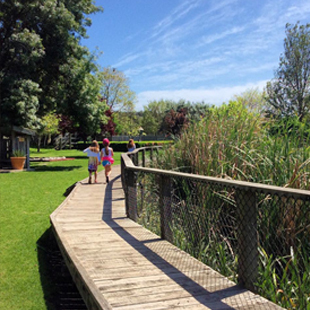 Our low rise boardwalks allow you to get up close and personal with nature without disrupting its delicate balance. With over 29 species of birds including the Dusty Moorhen, Brown Goshawk, the elusive Southern Boobook or Morepork and the uniquely beautiful Silver Eye, just admiring your surroundings under the shade of the Tea Tree’s is a sublime experience in itself. If you are part of a group, large or small, social or educational, embarking on one of our nature walks is a magical way to spend an afternoon. 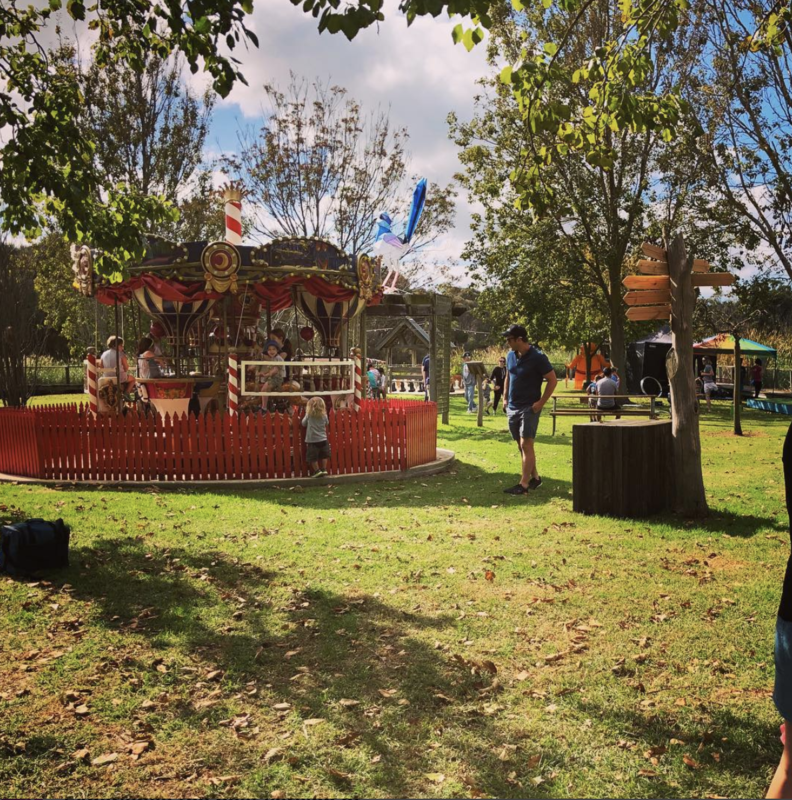 With a focus on native wildlife, you will hopefully spot a few of the mazes more charming residents including the Black Wallaby, baby Red Belly Black Snake.. (may also get a glimpse of his mother or his cousin the Tiger Snake! ), Bush Rat, Ringtail and Brushtail Possums and everyones favourite guest.. old Bluey, the Blue-Tongue Lizard and his many mates!